How I Gained It: I was always a chubby kid, and I matured very early. As a freshman in high school, I had reached my full height of 5’10” and weighed 210 pounds. What I lacked in speed, I made up for in endurance and reflexes. I was well-suited for being a goalie or catcher. It was the summer between my freshman and sophomore years when I discovered cycling. My friend had taken up cross-country running and let me use his really cool Fuji bike. I was hooked! I dropped 40 pounds that summer. After high school, I tried my hand at racing, but I didn’t have the leg speed nor the aggressive attitude needed to ride at that level. I took up long-distance road touring (typically 100 miles, otherwise known as century riding). 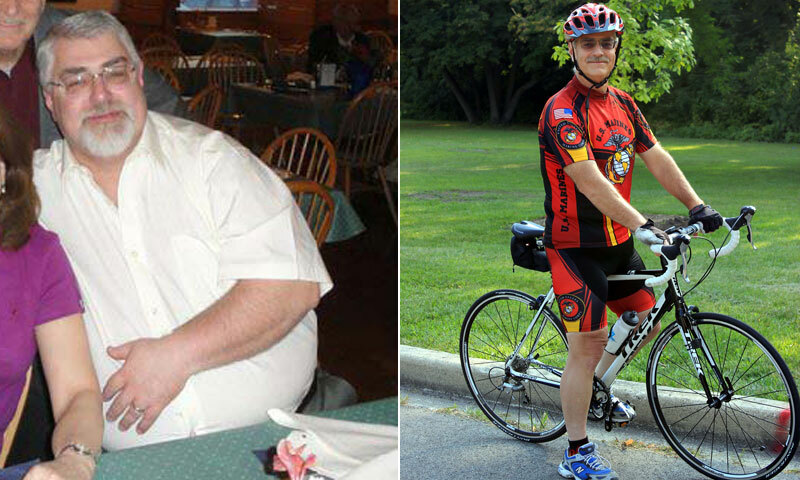 Cycling helped to keep my weight in check as I went through my 20s and into my 30s. It was during that time period that I met my wife. We met doing a charity 150-mile bike tour, and shortly after, we married. We rode together for several years until, for some reason, I lost the desire to ride. It was like my mind turned a switch and I went from athlete to couch potato. Of course, I kept eating as if I were riding 200 miles a week. Pick an excuse, I used them all — job stress, lack of time and so on. It wasn’t long before I was putting on copious amounts of weight. 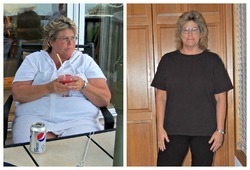 By 2003, my marriage had disintegrated, and I was well on my way to 300 pounds. Of course, I now had the divorce to fuel my eating. I managed to get stable at around 280 pounds for several years, so I got back into the dating scene. By 2009, I was remarried. Just when I thought my life was turning a corner, I was forced to switch jobs. Sadly, the new job was far worse than the old one, so I quit for a less stressful position as a security guard. Due to the sedentary nature of this job, my weight exploded. I was popping antacids like candy, and my new bride was sleeping in another room due to my heavy snoring. I could see the look in her eyes. It was not the look of disgust that I had gotten from my ex-wife, but one of worry and perhaps despair, although she kept a very upbeat attitude. Breaking Point: The breaking point came on August 4, 2011. I wasn’t feeling well, so I finally broke down and went to the doctor. Within minutes of her taking my urine sample, she started ordering multiple blood tests. She started to ask questions like, “Do you go to the bathroom multiple times at night? Do your feet tingle or do you get leg cramps at night?” I answered yes to those two questions, as well as several others. The diagnosis: I was a full-blown type 2 diabetic. I also had very high blood pressure and atrial fibrillation. She made it quite clear that if I did not deal with my issues, I would die of a stroke or heart attack. She went on to describe how diabetes would be a very slow and painful death. I must admit I knew something was up, but I had chosen to ignore it. Nothing like a good kick in the teeth from my doctor to get me motivated. How I Lost It: I already had the tools to lose the weight, but I just never had the drive to follow through. What I needed was a goal. Why not start training again? I came to the conclusion that I could dust off my cycling training regimen and turn it into a weight-loss structure. I ate six 300-calorie meals about every two to three hours. Yogurt and fruit were incorporated as snacks during the day. Lunch would be soup or a sandwich. Dinners were modest portions of lean meats and fish. Diabetes educators would prefer that we eat non-processed starches. I didn’t like brown rice and whole-grain pasta, so I ate small portions of things like white rice or potatoes, then piled on the veggies. At bedtime, I would have a slice of multigrain bread with peanut butter. It kept me from getting the dreaded night munchies, and it would even out my blood sugar. It took about four months until I was ready to start rebuilding my cardiovascular system. It was now about mid-January 2012, and I was down to around 270 pounds. My first attempt with an indoor trainer lasted about 10 minutes. With my heart pounding and my legs on fire, I thought for sure that I was done with cycling as a sport, but I stuck it out. I rode every other day until I was capable of riding for 90 minutes without stopping. By summer, I was around 220 pounds and ready to hit the road. I could see my skin starting to droop, particularly on my upper body, so it was off to the gym to redevelop my upper body and midsection. By Christmas 2012, I was down to 185 pounds. I was off all my medications. Blood pressure and sugar levels were normal. Now all I needed to do was ride my first century in 17 years. With each week of training, I got stronger and went longer, and on July 28, 2013, I completed my first 100-mile tour in 17 years — almost two years to the day that my doctor gave me the “Lose the weight — or else!” speech. To people who had not seen me in the past two years, it has been quite a shock. I did not realize how dramatic the change was. One friend insisted that I take my shirt off because he couldn’t believe that I didn’t have a scar from gastric surgery. I guess the most unexpected result of the whole process was I saved enough money from not eating fast food that I was able to trade in my carbon steel bike for a modern one made of carbon fiber and aluminum.